A somewhat regular part of my job lately is discussing with people how exactly one might go about doing data science on Hadoop. It’s really a very interesting subject and one about which almost everyone even cursorily associated with ``Big Data’’ has an opinion. Remarks are made, emails written, Powerpoint decks created; it’s a busy day, for sure. In the long term, they expect 3 to 4 dollar return on investment for every dollar. But based on our analysis, the average company right now is getting a return of about 55 cents on the dollar. That’s pretty concerning for those of us hoping for Hadoop to cross the chasm soon. As one might imagine, there’s been quite a bit of hand wringing about the problem. I don’t take such a dim view of it, though. It’s a matter of maturity and I’ll give some of my impressions shortly on why it may be hard to fulfill the data science portion of the ROI currently. One benefit from my vantage point within the consulting wing of a Hadoop distribution is that I get to see quite a few Hadoop projects. Being that I’m part of the Data Science team, I get to have a decidedly Data Science oriented view of the Hadoop world. Furthermore, I get to see them in both startups as well as big enterprises. Even better, living in and working with organizations from a fly-over state, I have a decidedly non-Silicon Valley perspective. The first is an organizational challenge, the second a technical/product challenges and the final is a challenge of human nature. One of the competitive advantages of Hadoop is that inexpensive, commodity hardware and a powerful distributed computing environment makes Hadoop a pretty nice, cozy place for your data. This all looks great on paper and in architecture slides. The challenge, however, is actually getting the data to the platform. Turns out moving data can be a tricky prospect. Much ink and bits have been spilled discussing the technical approaches and challenges to collecting your data into a data lake. I won’t make you suffer through yet another discussion of the finer points between sqoop, flume, etc. The technical challenges are almost never the long poles in the tent. Rather, what I have witnessed is that getting that data to start moving can be arduous and require political capital. I have noticed that there is a tendency to treat those who come to you asking for data with a fair amount of skepticism. These attributes are not specific to data science projects. Rather, the same principal applies to all projects that require an abundance of data. No data-oriented project can survive if starved of data and almost all Hadoop projects are data-oriented. When I was young, I liked to climb trees. Growing up in rural Louisiana, I had plenty of opportunities on this front. As such, I got fairly good at picking out a good climbing tree. There is a non-zero intersection of trees which are good for climbing and trees which are pretty to look at or have some satisfying structural characteristics. Often, however, the properties did not coexist in the same tree. Climbing trees were best if there were relatively low, thick branches with good spacing. Trees which were nice to look at were much more manicured with delicate branches and a certain symmetry. Platforms have the same characteristics, I think. You have platforms that are very finely manicured with a focus on internal consistency and contained borders. This yields a good experience for those who use the system as the originators intended. These systems are pretty to look at, to be sure. Ironically enough, I’ve always liked the sprawling systems with an emphasis on many integration points. They give the feeling that they are reaching out to you. That act of reaching out is the act of engaging. 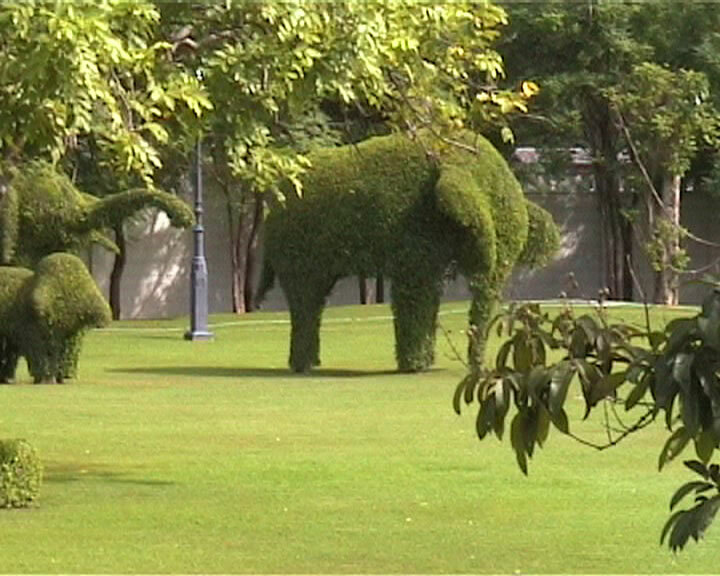 Hadoop is transitioning quickly from a finely manicured topiary sculpture to a fantastic climbing tree. It started out very self contained and internally consistently. If you used Java, you were going to have a good time (sometimes ;-). While you could use pipes and streaming to hook up your C++ code or perl scripts, you weren’t going to have nearly as good of a time. Equivalently, on the algorithm front, if you could express what you wanted to do in MapReduce then the world was straightforward. Now, as Hadoop matures, we see branches to other platforms growing and branches to other distributed computing paradigms growing. On the technical side, we can now write pure non-JVM UDF’s in Pig, Spark has proper first-class bindings for Python, you can even write yarn apps in languages other than those which run on the JVM. Much of this is thanks to the new architecture in 2.0, but more than just a technical direction, it’s the realization by the community that we need more choices. That being said, it’s early days and we’re not that far down the path to the new way of thinking. This will be solved with time and maturity. Data science isn’t a new thing. I know, this is a brave statement and a deep conclusion. Forgiving its obviousness and pith, I actually mean that most organizations are already doing and have been doing for years one of the core things people talk about as data science: developing insights from their data. Getting the data from one system to another takes 24 hours at least. Does this mean that those things aren’t really needed? If so, our job is easy, all we have to do is recreate SQL on Hadoop and convince organizations to put their data there. That solves big portions of the top complaints above. The answer is obviously that the current gripes do not remove the need for more data, differently structure data, other techniques in the data science toolbag. So, why aren’t the data analysts that I talk to chomping at the bit for them? One reason, I think, is that with increasingly complex data comes increasing complexities in dealing/processing that data. Furthermore, in structured data, the act of extraction/transformation/loading of the data was not a data scientist activity. It’s possible that, given more complicated data, just extracting features from it might require more arduous programming than analysts are used to. A good example of this is within the realm of natural language processing projects. Also, ``Big Data’’ data science isn’t as convenient as small-data data science. Contrast the ease of using Mahout or Spark’s MLLib with python’s scikit-learn, R or SAS. It’s not a contest; it’s easier and quicker to deal with a few megabytes of data. Since there is value in dealing with much more data, we have to eat the elephant, but it can be daunting without guidance and examples are few and far between. Ultimately I think we focus so heavily on new and novel techniques, the game changing paradigm shifts (with our tongues placed firmly in our cheeks sometimes) without discussing the journey to getting there. If we constantly look across the chasm without looking at the bridge beneath our feet, we run the risk of falling into the drink. Mine the data for likely incorrect or interesting data points that break with the characteristics found above. Over the course of the next few blog posts, I will take some recently opened data from the Center of Medicare and Medicaid detailing the financial relationships between physicians, hospitals, etc and medical manufacturers and use Spark’s Python bindings to look at the data, its shape, its outliers and look for data that may be amiss. I have been very careful to not draw conclusions or explicitly look for fraud. This is intended to be a demonstration of technique and I cannot verify that this dataset isn’t rife with bad or misclassified data. As such, I intended to demonstrate some of the basic and slightly more advanced analysis techniques that are open to you using the Hadoop platform. If you have the interest/ability to be comfortable in a Python environment, I think that for data investigation and ad hoc reporting, interacting with Hadoop via IPython Notebook and the Spark Python bindings is a fantastic experience. Interacting between SQL and more complex, fundamental analysis is seamless. It all communicates in terms of RDDs for maximum ease of composition. I could have used any of the rest of the Spark stack, such as MLLib or GraphX. Having all of this running on Hadoop, allowing me to do ETL and work in the other parts of the ecosystem such as Pig, Hive, etc. is an extremely compelling aspect as well. Ultimately, we’re approaching a very cost effective and well thought out system for analyzing data. It’s not all roses, however. When something goes wrong, it can be challenging to trace back the problem from the mix of Java/Scala and Python stack trace that is returned to you. There can be some IT challenges as well. If you use a package in python in a RDD operation, you must have the package installed on the cluster. This may pose some challenges as many different people are going to need differing versions of dependencies. Traditionally this is handled through things like virtualenv, but executing a function within the context of a virtualenv isn’t supported and, even if it were, managing a virtualenv across a set of data nodes can be a challenge in itself. If you would prefer to see the raw IPython Notebook, you can find it hosted on nbviewer.ipython.org.